Do I look like a Captain yet? Dilemma: My Landroval LM, Lennidhren, has long now surpassed my original LM on Nimrodel, Linett, as my main. 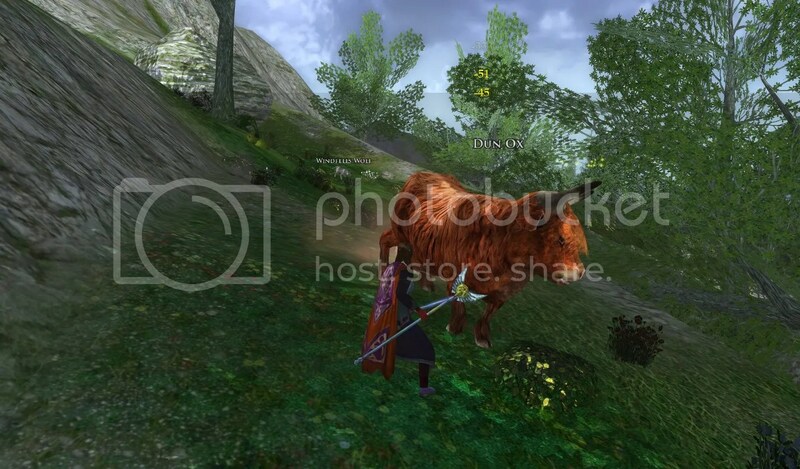 The Lonely Mountain Band has kept me so active on Landroval that I have sadly neglected Linett, who now languishes at 65 on Nimrodel. 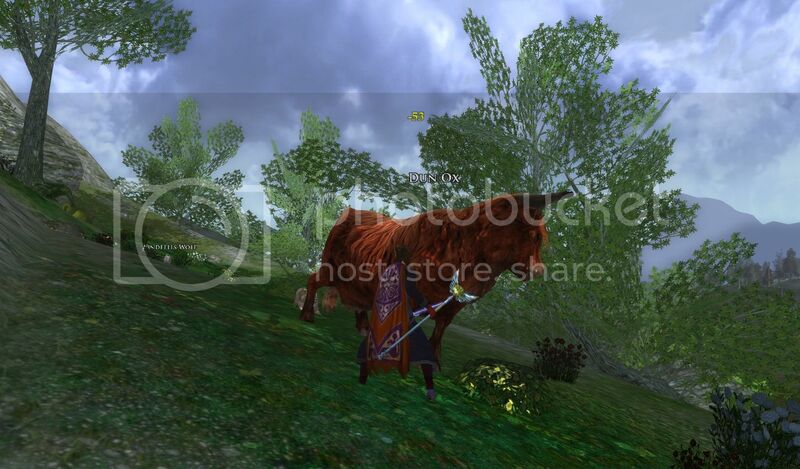 Recently, Locney was looking for a surname for his minstrel Thyn on Landroval. When Loc mentioned that he’s a man of Bree – Linett’s hometown – I suggested Redfern as a fine Breelander surname, and so Thyn became Linett’s ne’er-do-well cousin. But with Thyn on one server and Linett on another, family reunions would be tricky. I thought about just transferring Linett to Landroval, since I never play her on Nimrodel now. But it’s pricey…and I’m not crazy about having two of the same class on the same server. I have a feeling that transferring my 65 LM to Landroval would mean she’d still never see playtime. And my alts on Nimrodel would lose access to Linett’s lovely home in Falathlorn…though of course that may not matter much, what with the “not seeing playtime” thing. Well, it’s been more than half a year since my last blog post… /shame! 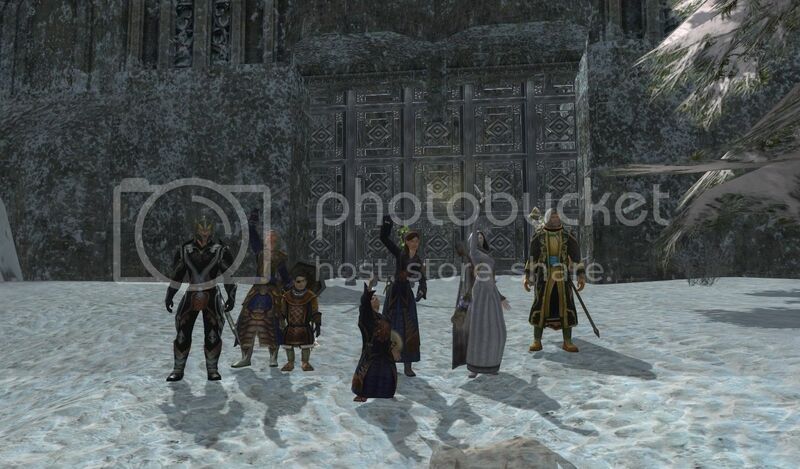 Like so many of the blogging community at my.lotro, I’ve been disheartened by all that is broken there. That combined with a very busy school year and the launch in August of the Ales and Tales Podcast – well, blogging (apart from podcast show notes) has fallen low on my to-do list. Anyway, I’m giving the new MME blogs a try now. – Linett has, however, taken on a new career…as a Jedi Sage in SWTOR. – The Ales and Tales Podcast is up to 21 episodes now! And we’ve recorded 29, just have the editing still to do on 8 of them. – I’ve still got a LOTRO Hat Knitting project in mind…to recreate hats from the game in knitted form, complete with progress updates on the blog and hopefully writing up the patterns here too. But alas! I’ve got so much other knitting in progress right now – gloves for my sister, a hat for my mom, several pairs of socks, a sweater I REALLY want to get finished so I can wear it while it’s still cold out – that I haven’t found time yet to start on those hats. 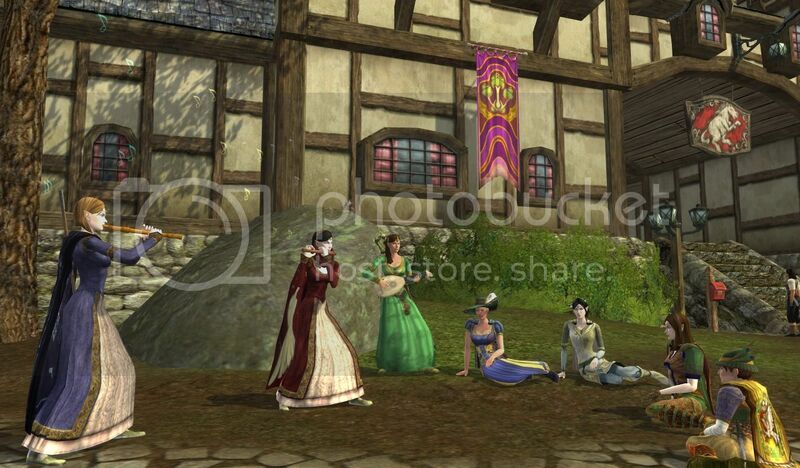 However, if you see a LOTRO hat you’d particularly like me to knit, comment with a picture! It might just inspire me to get this project started! Linett woke up, suddenly, with the image burned in her memory but without any idea what the dream had been about. There was something familiar about the singer, though. Was it someone Linett had met, or just caught a glimpse of, a glimpse now risen to the surface as she slept? She could not shake the feeling that she should recognize the girl with her lute and her copper hair. It was a bit early yet, but she rose anyway, unable to sleep again with this mystery prying at her. It occupied her thoughts as she stopped by the kitchens of Duillond for a breakfast muffin; it distracted her all morning as she tried to carry on with her research tasks in the Scholars’ Enclave. It troubled her so that she barely noticed when the elf Lennidhren, senior researcher, drew near. Linett conceded the point with a grin and a nod as she unfolded the letter and quickly read through it. Then the grin vanished and she sat up straighter and read through it again, more slowly. Lennidhren tilted her head and frowned in concern but sat silent until Linett finally found her voice. It wasn’t far to Telwen’s home, a stately abode in a Falathlorn neighborhood near the refuge of Duillond. Linnore met her there, summoned by a message Linett sent ahead with her raven-friend, though the bird seemed to pout at being used as a carrier pigeon, and would not quite look at Linett when it arrived with her cousin at Telwen’s house. Boarded up the house was indeed, and a note on the door indicated that it was to be reclaimed by the Housing Commission for delinquency of payments. “Can Telwen have fallen on hard times, and been unable to afford the payments?” Linett asked. Linett tried to force the door but found it too firmly boarded for that. So the two of them started searching the grounds for any clue. But it was Frigga the raven-friend who found what they sought. Its loud caw drew Linett’s attention, and she looked up to see the raven flying down from a hole in a hollow tree, with a bit of paper tucked in its beak. Linett took the crumpled paper from Frigga and unfolded it carefully. It seemed to be a page torn from a book, with words carefully handwritten. Names. She showed the list to Linnore. We hope to do a repeat performance later this Yule season, especially as our dear minstrel Digger was taken ill and could not join us this time. So watch for Tinnu caroling yet to come! So anyway, over on Landroval, Lennidhren is still working her way up through the levels and generally just has to cheer on her fellow Lonely Mountain Banders from a distance whenever there is a kin run of any sort of end-game instances. But Linett’s new kinfolk on Nimrodel, the Tinnu uin Galadhrim, have begun to venture into the stronghold of Helegrod, so finally I can say that I have experienced a raid. 🙂 Last Friday was our first attempt (well, I think so. First I took part in, anyway) and it went well enough that we did it again tonight. It went a good bit smoother with experience this time, although we only did one quest in each wing to collect the Helegrod marks, instead of completing the whole raid. I do hope someday we’ll do the whole thing, just so I can see it, but it would certainly be a time-consuming endeavor! Long ago I posted about my new favorite mob, the Fiery Grims of the Flaming Deeps. Well, they have been superseded. Meet my new favorite mob – the Dun Ox. Why am I so fond of this big guy? For one reason only: The highly amusing animation that occurs when Linett stuns him with a Light of the Rising Dawn. Usually the mob will just kind of stand there, with shoulders slumped if they’re a bipedal type, or in a crouch if they’re of the four-footed variety. Not this one. The Dun Ox performs a rolling-side-to-side maneuver that makes him look a bit, well, drunk, and cracks me up every time.